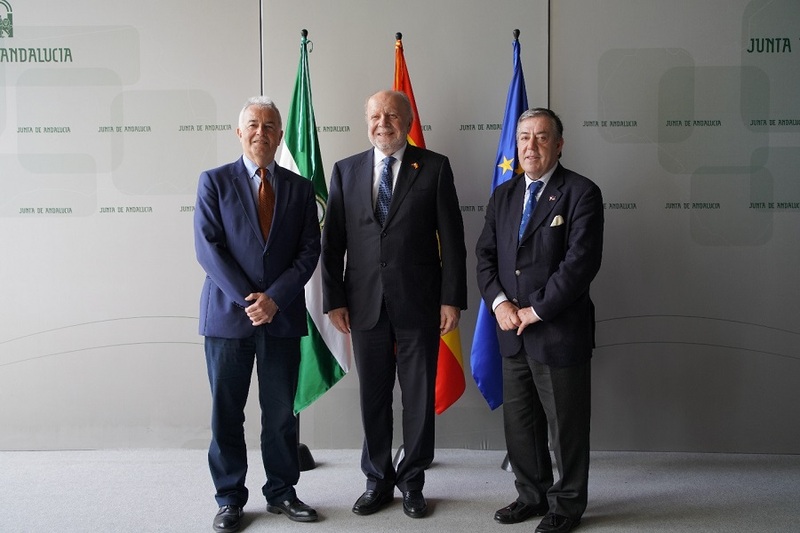 L-R: Mr. Ángel Luis Sánchez Muñoz, Director General for Foreign Affairs of the Regional Government of Andalusía, Ambassador Philippe J. Lhuillier and Honorary Consul General Jose Ignacio Bidon y Vigil de Quiñones at the headquarters of the Junta de Andalucia. The Philippine Ambassador to the Kingdom of Spain Philippe J. Lhuillier undertook a series of meetings with Andalusia and Sevilla officials and the Filipino Community, as well as a trade presentation, from 5-6 April 2018 in Sevilla, marking his first official visit to the southern Spanish autonomous region of Andalusia. 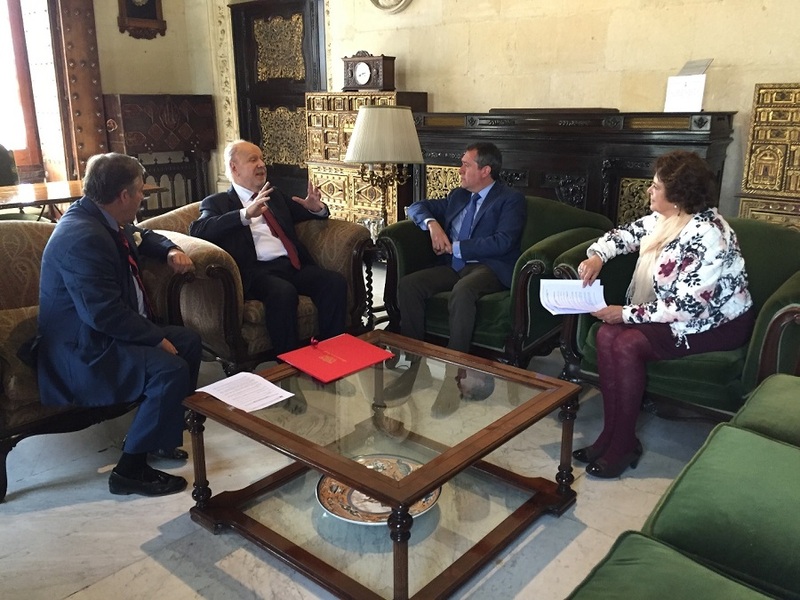 Ambassador Lhuillier reiterated the country’s desire to improve bilateral ties, particularly in improving economic relations with Andalusia and Spain in general. As part of his visit, Ambassador presided over a conference on business opportunities in the Philippines with the Sevilla Chamber of Commerce on 05 April 2018. Seventeen entrepreneurs, including Presidents and CEO of Sevilla’s top companies, attended the conference on business and trade opportunities in the Philippines. Ambassador Lhuillier in his address enticed Sevilla’s top business honchos to invest in the Philippines, underscoring the Duterte administration’s current thrust on infrastructure and development. Among those who attended were Jorge Domecq of Grupo Emperador, Juan Ramon Guillen of Aceites del Sur, Juan Manuel Ortega of Royse, and Adrian Otiz of Xtraice. The Philippine Ambassador to Spain also met with Mr. Ángel Luis Sánchez Muñoz, Director General for Foreign Affairs of the Regional Government of Andalusía; Mr. Antonio Sanz Cabello, Representative of the Spanish National Government in the Autonomous Community of Andalusia; Mr. Ricardo Gil-Toresano Riego, Representative of the Spanish National Government in Sevilla; and Hon. Juan Espadas Cejas, Mayor of Sevilla. 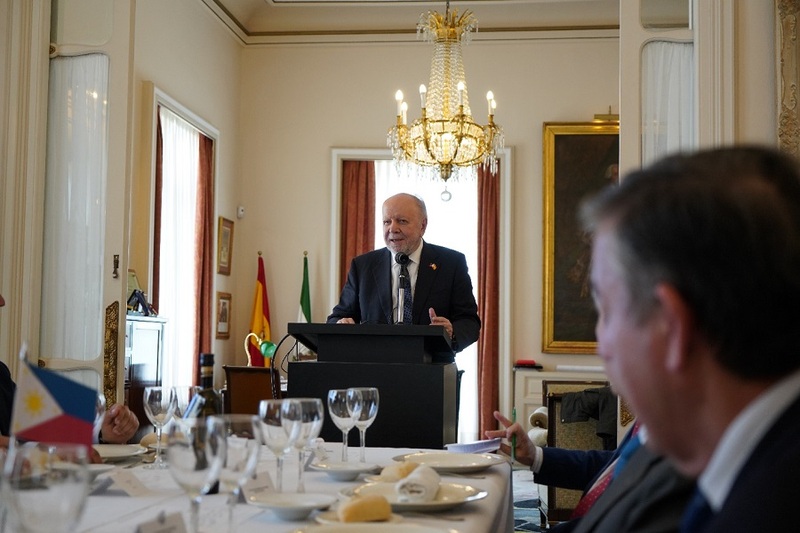 Central to his message to the Spanish Government officias was looking after the welfare of Filipinos in Andalusia whom he met in a gathering for Filipino community members at the Honorary Consulate General. The Filipino community expressed their appreciation to the ambassador for the visit and the projects lined up for all Filipinos in Spain and Andorra. Ambassador Lhuillier discusses Philippine-Spanish relations with Sevilla Mayor Juan Espadas Cejas as Philippine Honorary Consul General Jose Ignacio Bidon and María Carmen Clarisa Castreño Lucas of the Sevilla City Hall look on.